Now that the book is in the printing press, I can point out that the story has marched on in the same erratic style that it had begun. New improvements have been made, and new members have joined the team. There is a long way to go and new chapters will, surely, have to be written, but one thing is for certain. It is going steadily forward. Maybe the crazy idea about the sparkling vodka, isn’t so crazy after all? Interested in following their quest, go to the blog ”What’s sparkling?”. Want to read the book? Order here. Do it with originality. That is the first prerequisite for development and creative thinking. What is the point of doing something that has already been done? Do it meaningfully. This is the second prerequisite for development and creative thinking. No meaning, no benefit. Without benefit, what’s the point in doing it at all? Do it with taste and style. Regard the world as a mirror. An ugly grimace reflects back on yourself. Treat others as you would like to be treated. Do it with a touch of integrity. Don’t let others walk all over you. You are certainly better than you think you are. Do it thoroughly. Too many things in the world today are done with little or no thought. Let you hands follow your thoughts. The meaning of life is to be so focused on doing what you want to do, that you are too preoccupied to bother about the meaning of life. Do it in an ethical way. Be honest, and true with good intentions. This way your chance to be who you want to be increases. Do it wrong. In the rear view mirror mistakes are always wrong. In a future perspective mistakes count for hope and power. Mistakes essentially are all about letting your thoughts be exposed to more possibilities. Do it because you enjoy it. Life is here and now. Just like a game, for games help you develop. Do it with a smile, or do something else. Do it gorgeously! We are short on beauty and passion in the world. It doesn’t cost more to produce than the ugly and cynical. And the world does not become any more beautiful and passionate if you cut corners with craft and aesthetics. The world has always toiled between the conservative and the radical. While one wants to control and maintain, the other strives to revaluate and reformulate. The first approach brings out continuity, the second renewal. And if truth be told we need both. Little by little, people of the twenty-first century have started to see that the world is balanced over a steep ravine between two idea cultures. We are on the way out of one of them, the one that belongs to Mr. Spock and his hardboiled cronies. The other one is marching forward. It is Gump’s world, the heart’s and art’s great comeback. The problem, that many overlook, is that one side is often emphasised at the expense of the other. In Spock’s conservative business world the rational rules. It’s a cold perspective that creates a preserving power that reminds us of a black hole. The black hole supports itself through simple mediocrity, mainly with brands that don’t have the creative power to keep their distance from the hole’s paralysing gravitation. It is of no use, and it achieves nothing more than to strengthen the category leader; while the other brands are sucked further into the middle to suffer an inevitable death due to a lack of attention. It is the market’s own version of hell. It is a deadly sequence for marketing communication where everything is transformed into a cacophony of information and tired clichés. But the consumers’ gaze has never rested upon yesterday’s news. She is constantly searching for refinement. For those responsible for the brand there is just one piece of advice. Flee from the black hole. Look in a fixed direction towards the market’s outer limit of demarcation, the creative zone – to the speculative, potential reality, where contrasts coexist. Follow the direction like a curious fool. Make your way in a zigzag way, like a child walking to school. Search like an artist: devoted and wide-eyed, disrespectful, foolhardy, intuitive and reinvestigative. Search outwards. A step inwards will make you feel secure, but the consumer bored. A step outwards will make your heart turn somersaults while the consumer sharpens her senses and becomes exalted. Search continuously outwards. As the black hole feeds on standard and grows through experience, the creative zone moves constantly outwards. This marketing merry-go-round offers you laughter, dreams and experimentation, but it eats into your self-confidence, as you will surely make a few, small mistakes along the way. Mistakes that the suits regard as needless expenses, but here in the innovative field they work much in the same way as market research. Big mistakes are costly, but small mistakes are feedback that helps you to achieve better decisions. The costs for the wrong steps should always be considered in relation to the two greatest mistakes of all, namely, to convince yourself that you know more than you actually do, and, to never achieve any great ideas at all. “We minimise the risk by maximising the risk,” said Hans Rausing, one of Europe’s richest men. Nobody has ever accused him of being foolish and careless, and if proof be needed his company, Tetra Pak, followed this uncompromising motto. It is not so much the mistakes that impede development; it is the excessive wisdom that kills the speculation and the intuitive search for new ideas. It is the inflated belief in the rational that poisons the creative thought and suffocates many brands in their infancy. 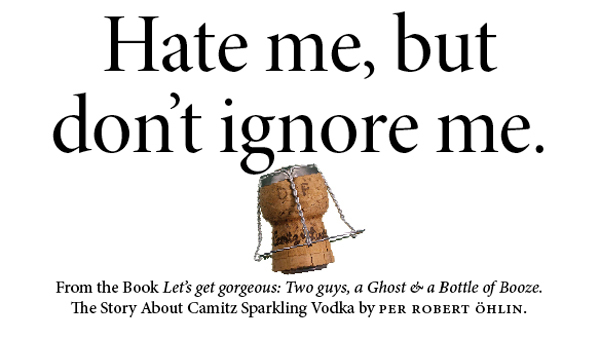 The story of Camitz Sparkling has bordered on serious mistakes and wild speculation. Mattias and Peter have higher powers to thank for the mistakes they have been through, and regard them today as badly-needed rebukes and hard-earned lessons. Without them the world would never have got to taste anything remotely close to Camitz Sparkling. And without all the carbonation problems the vodka would never had been put to the test forcing it into a constant stage of improvement and refinement that has made it what it is today, the world’s most exclusive vodka. The moral is that knowledge is conceited and inflexible, but wisdom is humble and always experimental. Your task is to constantly search, not to know. This is what we have learnt so far. Let’s celebrate this and head for the party. In the topsy-turvy world of the advertising industry, it is better to be hated than to be overlooked. This little philosophy is built on the simple logic that hate is made up of strong and genuine feelings while indifference is not made up of any feelings at all. It means that there is a huge distance between you and the apathetic, like fierce rivals can actually become close friends through the sharing of certain experiences. This band becomes even more apparent when an additional rival turns up and threatens them both. It is essentially crucial to know whether your consumer loves, hates or is bored by the presence of your product and its category. Ask yourself what it is that characterises her buying decision within your particular category. Is it more to add a little spice to the humdrum of her existence? Or is it characterised by pure apathy? This applies to purchases requiring substantial investment, which means that the consumer runs of losing something – money, status or work. Some would like to believe that it is all down to a rational decision, but we now know that humans have no downright rational functions in the brain. It is this type of decision that makes the consumer defensive due to a strong feeling, namely the fear of losing. Consequently the decision takes a while longer to make, and the consumer usually seeks information from more sources before reaching the decision to buy. The aim is to make her feel secure and to give a winning argument for her decision to buy. It is also important that she feels smart, and that you help her rationalise and verbalize her choice to others. Here we are talking about defensive low-involvement products. It is a choice that the consumer does not really relish making, as they are too boring. She can’t be bothered making a stand on all these small and meaningless decisions, so she decides one time and then just follows a routine. The choice is characterised by security. She knows what she is going to get so why take a chance on something new and unknown? It doesn’t carry any great significance, so why bother? The challenge is to break the behavioural pattern. The most usual way is to give samples and discounts. Another way is to build a personality. This deals with brands that the consumer chooses to decorate her life with in order to add a little style and zest, for example products in the categories of ice cream, soft drinks and entertainment. We can also include durable goods that have been heavily discounted like a flat-screen TV. The psychological driving force is the question of which brand provides the consumer most value. The choice is governed by short-term pleasure and satisfaction. The price is more often that not no great obstacle as most of the products in this category are prone to fierce competition. The task is to get the consumer to lust after the product and want it here and now. In order to succeed, you need an extremely low-price or considerable originality and feeling. The challenge is to create a cult status. To transform the brand into a so-called lovemark, a relationship that creates loyalty beyond reason. So where does Camitz Sparkling fit in? It is without doubt an offensive choice and an extremely conscious purchase that is driven by personal identification. It is a lifestyle brand, a marker for who you are. One question remains though: How can this be communicated? A brand must be built on a living soul and a genuine dramaturgy. To be cultural and social, it must be based on a narrative, a tale that can be retold. And like all good stories, it should contain some form of heroism, a drama that your target group can identify with. The whole scenario is reminiscent of Hollywood’s dream factory. Everything deals with dramaturgy, conflict, character and action; that’s probably why you would rather watch a film, or read a book, than watch the TV commercials. Hollywood knows how to capture its public. When the advertising industry fights to hold your interest for 30 seconds, Hollywood stories have us transfixed to the TV screen for up to two hours. So the question is: can the business world learn anything from the film industry? Fundamental dramaturgy deals with the moulding of a character (the brand’s personality). It is essential that this character has both good and bad sides (functional, psychological and social qualities), otherwise we would find it hard to identify with her. The character also has to have a long-term goal in life (vision) so we know where she is heading (strategic direction). And more importantly, she must stumble across obstacles along the way in her quest for success. This leads us to two crucial elements: in one part, attention, and in the other part, to force the character into action (tactic), which is the first prerequisite for a story. The obstacles function as challenges for the principle character. They have to be sufficiently difficult to demand a large portion of courage (feelings means drive) from our character to accept them. If she manages to overcome, she grows in stature and becomes almost heroic. All stories are built on some kind of valour. It is, after all, the hero that we identify with. In short: no identification without the hero. No hero without challenges. Challenges don’t appear out of thin air, they must be built on friction, the hero’s own problems. So now you know what differentiates the film industry from the advertising industry. It is an ingredient that the business world loathes as much as a groundsman loathes moles. In Hollywood they call it conflict, the art of all good narratives. Friction is presumably the reason why we are more familiar with a character like Dirty Harry than a brand like Opel. It is strange, as Dirty Harry is an old character from the seventies who is very rarely seen today. Nevertheless, most people know how he thinks and acts, what drives him and what scares him. For instance, what does Dirty Harry have that Opel lacks? A fundamental drama that appeals to us deep within, as opposed to the run-of-the-mill core values? Remember Paul Potts? He was a shy, uglyfaced, and chubby mobile-phone salesman from South Wales, who liked to sing opera in front of the mirror. One day he entered Britain’s Got Talent, and he sang Nessun Dorma in such a way that he nearly knocked Simon Cowell off his chair, made Amanda Holden cry like a baby – and to top that off: won the whole competition, got 25 million hits on YouTube and became world famous in a blink of an eye. Now, was this because he was the best opera singer the world has ever heard, or seen? Or was it because he acted like a true hero and accepted a challenge that would make the rest of us look the other way? Was it because he evoked the classic archetypal story about the ugly duckling? Was it because of what he made us feel? A strong personality is interesting as it is two-fold. It contains advantages and weaknesses, ambitions and fears. The good characteristics are the ones we strive to identify with. The weak ones give credibility to our character, but also create friction, which in turn gets our attention when it is put to the test. Almost everything that is worth narrating emanates from our archetypes. The old yarns are given eternal life as they are respun and become a part of popular culture. It deals with about a dozen primary dramas that we can roughly split into four fundamental personal themes. All four themes describe the characters that are necessary for the individual strategies to achieve success and balance, while sharing the same overall aspiration. One thing they all have in common is a strong endeavour to succeed. But where is the friction, the drama that makes everything interesting? A personal drama arises through frustration and obstacles. One peculiarity that you find in all humans is that of hope. Hope for change. We always aspire after something that we don’t have, which in turn leads to a want or fear. For example, someone who fears solitude dreams of a collective community. And contrary, someone who feels suppressed by the collective community is desperate to brake free. Consequently a person who experiences the feeling of being diminished by power and authority wants change. And a person who feels discomfort in the presence of chaos and disorder leans towards stability and control. The trick is to identify where your target group belongs. When you have succeeded with that, you will know which buttons to press. 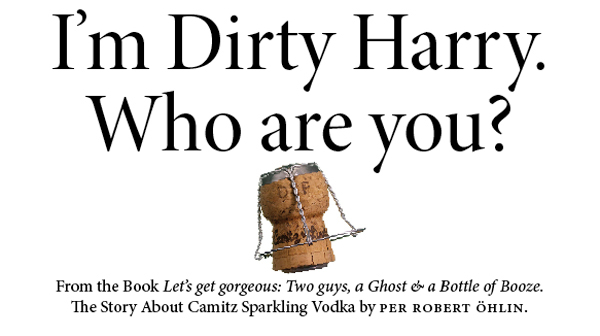 The story about Camitz Sparkling derives courage from the myths about changes. The base of the story is about the rebel, hero and inventor and their fight for progress. Not to mention a part of the seducer’s archetype, a personality that seeks intimacy through devotion, sexiness, sensitivity, luxury and passion. Just like the rain after sun, it is usual for an important objection to be raised: Is it really necessary to build a brand? The answer is no. There are, of course, exceptions. When you have the answers to the Greek’s questions (see chapter 3: The old, bearded Greek) you also have the starting point for the brand’s strategy, tactics and culture. Not one of these three aspects can give a complete picture of the brand, because it doesn’t have one, but together they provide a fairly accurate image. To explain this in a better way and to make it more fun, we can use the assistance of two well-known characters. The outside can be personified by Mr. Spock from Star Trek. His strengths are his rationality and the fact that he analyses complex processes and breaks them down to their basic elements. He is a cold-hearted reductionist. But he also has two grave shortcomings. The first is his lack of feelings. Those who lack sentiment can not be empathetic towards others, which means that his life is devoid of meaning and he becomes encompassed within himself and psychotic. The other shortcoming is a consequence of the first; he can’t see complex connections. These always carry with them inherent contradictions and they make him extremely nervous. He can’t relax before he has broken down and compartmentalized everything. Of course, Mr. Spock is not real, but there are many who would love to be him. This is especially so in the business world, which is to a great extent built on ideals founded hundreds of years ago by Newton’s mechanical physics and Descartes’ dualistic philosophy, and then engulfed further by Skinner’s behaviourist psychology. The Spock character is built on a gross misunderstanding about the human disposition and how people reach decisions. We are not rational and we cannot cultivate rational decisions, because the mind is not constructed that way. The rational functions in the cerebral cortex and the emotionally based functions in the limbic system are wired together, which is a consequence of the rational and emotional behaviour being basically the same thing – namely a wish. Either you want something positive to happen, in which case you are emotional. Or you try to prevent anything negative happening, in which case you are defensive – or to use a less careful term, you are rational. The fact is, you are emotional in both cases. As they are intertwined you can never maintain that you are thinking one hundred percent rationally without your thoughts running the risk of being tarnished by your emotions. Rational thoughts are in reality feelings motivated by fear, that’s why you tend to take more time before you reach a decision. But this doesn’t mean that you can eradicate your feelings by thought alone. They came first, and they are essential for you to reach any sensible decision at all. Studies have shown that patients with a damaged connecting link between the limbic system and the prefrontal lobe make devastatingly bad decisions, despite the intellectual ability remaining unchanged. The thing that all the Spock characters must try to understand is that feelings are the greatest force. Everything begins with a feeling. The feeling develops into a thought. The thought materializes into words. And if the words are deeply rooted in a strong feeling, it leads to action. That’s enough about Spock, now over to the personification of the inside, to Forrest Gump. He is Spock’s antithesis. He is not particularly intelligent, if anything he reminds us of a child. He is easy to make contact with, fun, curious, empathetic, intuitive and immensely creative, as he has extreme difficulty in fixing boundaries. Despite being a wizard at getting things done quickly, it is often in a rash, imprecise and undetermined way. This often gets him into deep water (where he quickly finds a solution). But Gump has one major advantage over Spock. Not as a real person but as an emotional personality type. In the book Branding according to Forrest Gump, by Per Robert Öhlin (in Swedish), the depiction of Gump is from Plato’s aspects in order to show that none of the different aspects are completely true, and they need each other to create a reasonably corresponding picture with reality. Outside: Medium height, weight just under the average, short hair, IQ 75. He is an idiot. Inside: He is honest and pleasant. He does strange things at times. But he has a heart of gold. Contextual: Born in the American deep south and raised in a small town at the beginning of the fifties. Constantly lives under the threat of institutionalization. Enlisted to the war in Vietnam where his loyalty, strong ethics and dedication made him into a hero. The very same qualities later contributed to making him rich. As you see, the result is totally dependent on your choice of perspective. The explanation is that there are no facts. We live in a world where different truths compete with each other, which are totally personal accounts and often the result of a chain of social agreements. Whatever it is you want to describe, be it a person or a brand, you should pay heed to all three spheres in order to see the whole picture and to gain complete comprehension. As you surely already realize, Camitz Sparkling is deeply rooted in all three spheres. In the industry we usually talk about two of these: The USP and the ESP. Now let’s talk about ASP. There is a lot of talk about brands these days. But many seem to have a muddled view of what they really are. There are those who still talk about brands as if they were the actual product. Many believe that it’s all about a name and a symbol. Others believe that it is something that can be dissected, analysed, measured and controlled, something that can be captured on paper and stored in a binder. Even others have the conviction that a brand is just a gut feeling or an idea in the mind of the consumer. A brand is basically a promise. It has always been so: a promise of authenticity, quality and continuity. The brands of today have even developed into a relationship, and relationships, wherever in the world they might form, are built on reciprocal altruism for mutual benefit. Look upon the brand as a contract between the company and the consumer. The company strives for profit, the consumer chases self-improvement. The liaison between the both of them is the brand. And what do we have in common? In this encounter it is more often than not the company that has the most to prove to fulfil its part of the bargain. It must show considerable emotional qualities: become more trustworthy, sensitive, honest, intimate, responsible, innovative, enigmatic and entertaining. In short, more human. The consumer returns the favour with attentiveness and loyalty. The recipe for success consists of equal parts of both right and wrong. Or to express it in a more correct way, equal parts experience and naïve gambles. This means that when an innovation comes to life it already consists to a certain something that is by definition wrong. “Every act of creation,” said Picasso, “is first an act of destruction”. When an idea becomes accepted it in turn becomes a part of the new norm, which, in order to develop, must be challenged by some new defect. The antithesis of this is moderation. Moderation demands correctness, security and continuity. Most people in the business world want moderation. They don’t want to stand out from the crowd and risk falling foul to criticism. Moderation is stagnation in a world that is constantly moving forward. Moderation is a black hole, whose attraction of gravity absorbs everything that is not exceptional. Peter, Mattias and the crew behind Camitz Sparkling revolt against moderation. They despise moderation. In order to break into the vodka industry they have to have all qualities but moderation. They must establish their product as the most attractive, enjoyable and interesting – to be able to attract the most attractive, enjoyable and interesting consumers. Those who refuse to follow the rules of moderation are brought face to face with more contradictory truths than those that we usually take for granted. And that’s why we are about to make the acquaintance of an old, bearded Greek, a callous spaceman and a complete idiot. I spoke to Per Robert Öhlin the other day about new blog ideas. 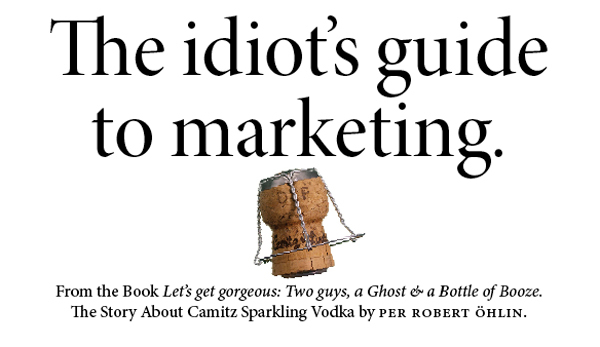 We decided to publish the last part from Let’s get gorgeous, a branding casebook about Camitz Sparkling Vodka, founded by Mattias Lindberger and Peter Camitz. The main character, Jhoan Camitz, is killed by a dead man in New York. (Try figure that one out.) At the same time, his friend Mattias, and Jhoan’s older brother, Peter, are sitting in Stockholm, finding themselves in ecstasy, as they believe they have just come up with a brilliant idea. 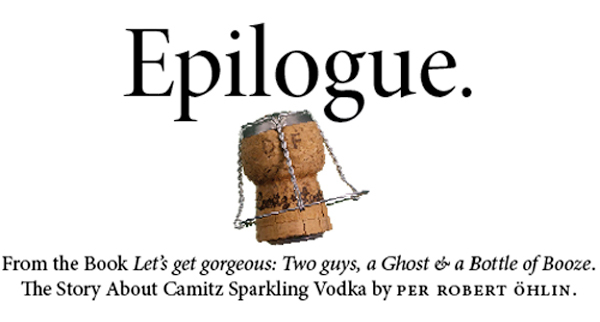 From that moment and onwards, the story about Camitz Sparkling Vodka, continues in leaps and bounds, between hope and despair. The first of the three men is a living cliché of an inventor. A hyper-intelligent, introvert mad man who would rather ponder over difficult problems and dream about thunder storms, hail and lightning. The other man is the renowned commercial filmmaker who died in a bizarre accident. He viewed all of life as if through a caricature lens, where most things were portrayed as mischief and big laughs. The third one started his career as a male model (found by none the less than Bruce Weber himself), but who grew tired of flying around the world like a smiling ad and therefore decided to turn it all around; he made use of his experience of being directed and started to direct himself, together with Jhoan. They have been faced with physics, chemistry and electronics which all seem to lead a life of themselves. They have had to live through a Stockholm premiere, which ended in humiliation. They have had to witness bankers being sprayed with foam of liquor. They have met Chinese fortune hunters who have led them astray. The have dealt with people who haven’t kept to their words. And people who have turned deaf and dumb when faced with having to make decisions. However, all the failures have given them a lot of experience, making them wiser and better than when they started out. And it finally looks as if they have made it. Today, there are people all over the world who actually seriously believe Camitz Sparkling Vodka as the best vodka in the world. What a journey! 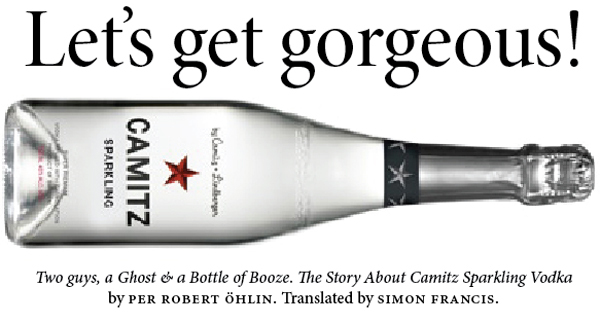 If you have read this far you should have a pretty good perception of what Camitz Sparkling stands for. You have got to know the people behind the product, including their strengths and weaknesses, dreams and nightmares. You know all there is to know about the brand’s shape, function, quality and performance – including the shortfalls. You should also have gained an insight into the significance of the brand, the feelings it creates and what it means to you. First, you have to ask who you are and where you are. Your qualities, starting point and surrounding terrain are the given prerequisites for everything you aim to do. Then you need to decide where you want to be. Remember that the consumer is the intermediate goal that takes you to the destination, sales. You need to choose a direction, as it doesn’t matter how fast you run if you are running in the wrong direction. In theory it is simple. The problem is to get it to work in reality. All this is an integral part of the mission for Mattias and Peter to establish and build an internationally, marketable brand. But what is a brand? And how do you go about building one?